The Eric V. Hauser Memorial Library is the academic heart of campus. The library is home to over 640,000 volumes, including a copy of every Reed senior thesis ever written. 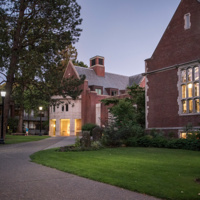 The 1989 postmodern Gothic addition preserved the original Tudor Gothic exterior by incorporating it into the central reading room. Legend has it that a group of audacious students also managed to entomb an MG convertible in the building’s foundation during the renovation. The library includes the Reed archives, special collections, an instructional media center, and a visual resources collection.